Have you ever reached for an article of clothing without knowing why, but then later discovered that there was a method to your madness? As Freud claimed, there are no accidents, and given that, perhaps our wardrobe choices are driven by desires and thoughts unknown to us. This was most definitely the case in my choice of wearing my "vintage" J. Crew school of fish skirt today. Last night before bed I was reading an article about the plight of Rufus, the beloved 37 year old fish that inhabited the now closed Bahooka Tiki Bar and restaurant in Los Angeles. The Bahooka closed its doors last spring to the dismay of many people who loved sipping flaming Mai Tais while watching Rufus and hundreds of other fish swim about their tanks, which were tucked away in seemingly every nook and cranny of the restaurant. The new owners of the restaurant promised to keep Rufus and let him live out his days in his tank, but recently Rufus has gone missing. One might not think this to be all that big of a deal, but Rufus was somewhat of celebrity, starring in films such as Fear and Loathing in Las Vegas. But more importantly, I think many people forged a connection with Rufus (me amongst the score) and the restaurant itself where people shared drinks and milestones with friends and family. After reading the article on Rufus and reflecting on the blog posts that I did in the past about the Bahooka and Rufus, I felt a little sad to see this part of my past and Los Angeles gone or, in the case of Rufus, hopefully just temporarily missing. 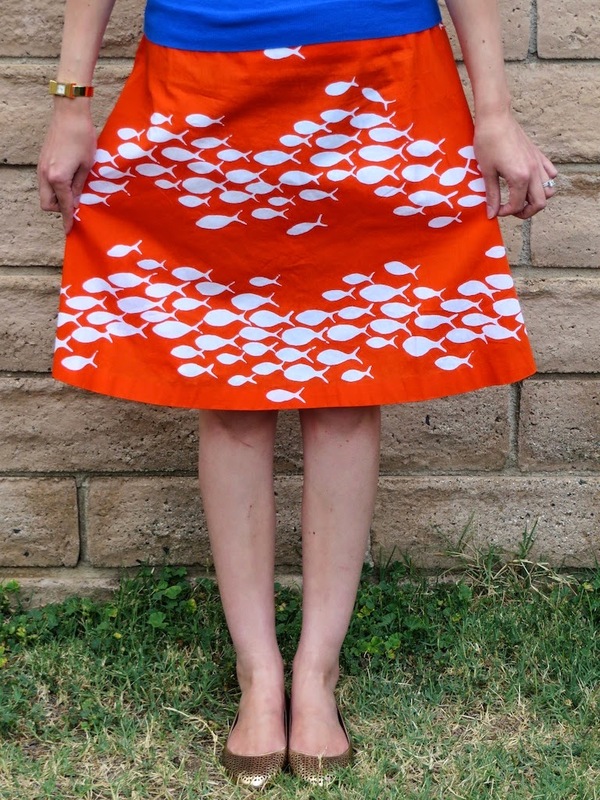 Perhaps that is why when I woke up in the morning I just happened to pick out this fish skirt and as I was brushing my hair in the mirror and looking at the skirt I suddenly, in my somewhat out-of-it morning haze, realized that it was inspired by my reading of the article and reflections of Rufus the night before. The blue, red and matching gold accessories I wore today, for whatever reason, kept reminding me of Wonder Woman. I don't know why, it just seemed like the same color palette as her outfit. If I was Wonder Woman I would use my superpowers to find out where Rufus is and bring him back safe and sound! Here's hoping for a safe return of Rufus! For other posts I have done on the Bahooka and Rufus check out Old School J. Crew and Tiki Bars and Bahooka or Bust on my blog. Below you will see some of my past photos of Rufus and the Bahooka. Oh no, Rufus has gone missing? I thought he was too old to move safely, what does this mean if he's not in his tank anymore? Thanks Lisa! I guess the new buyers said they would keep Rufus, but then they still haven't done anything with the property yet. When the guy who cleans the tanks came by recently he realized that Rufus was not in his tank. (He's certainly too big to misplace!) I think many people fear that Rufus might be dead, but hopefully he has safely found a new home! Hah oh gosh it looks like he is smiling in that photo! Thinking good thoughts for Rufus to be found. 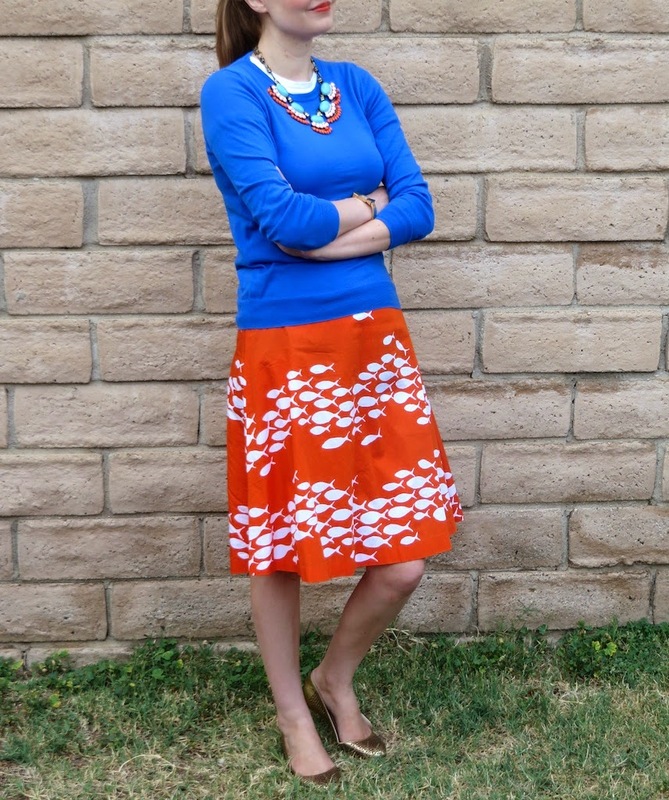 And your outfit is just adorable - I love the bright colors! Thanks Laura! I agree. Now that I look at the picture, it sure looks like Rufus is smiling. How cute! 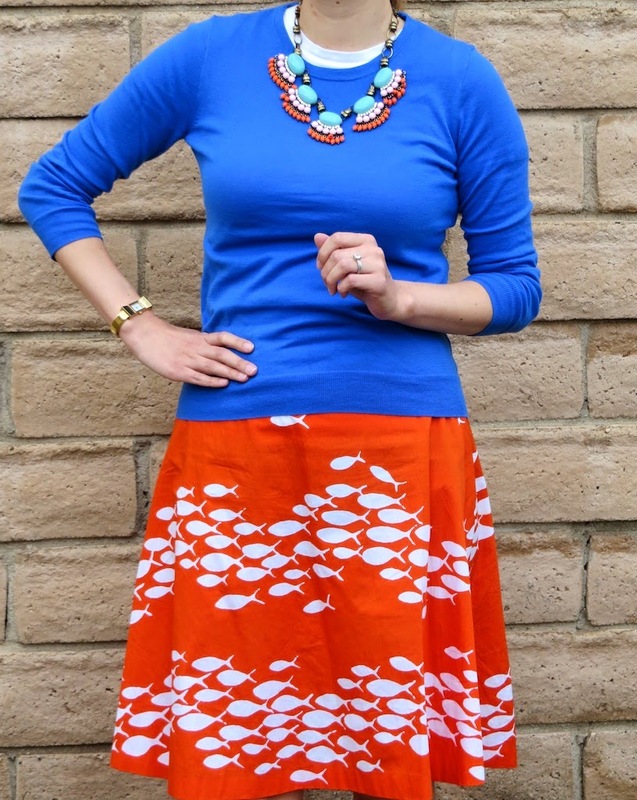 If you are ever interested in selling your J Crew School of Fish skirt, I would love to buy it!